Claudine was born in France, but moved to the United States in 1960. Earning her Emergency Medical Technician certificate in Blacksburg, VA put her on the road to a career in traditional medicine. Moving to New York State, she worked first as a Respiratory Therapy Technician and then as a Cardiovascular Technologist in an Elmira, NY hospital. Most of her ten years there was spent as supervisor of the cardiovascular laboratory. She resigned from that position to found and manage a medical diagnostic company for hospitals, clinics, and independent physicians. This was not enough for her. She became interested in healing the whole person, not just symptoms. In1994. She graduated from the Barbara Brennan School of Healing and in 1996 graduated from Rosalyn Bruyere school and also became an Ordained Minister of the Healing Light Center Church. She taught energy healing for seven years on the French Riviera. In 2002 she joined the Reconnection team, continuing as an associate instructor until her December 2011 retirement. Following her heart she was guided to take the Awakening the Illuminated Heart workshop .She was so impressed with Drunvalo�? ?s lifework and loving energy that she had to become an ATIH teacher. Her deepest wish is to share this work all over the world. Life responds with Joy and power. �?��?�Everything we need to begin our ascension process is given in this workshop. personne, alors la Vie répond par la Joie et la puissance. Un grand merci à Claudine! Très bonne formation , je suis empellement satisfaite de la formation. La formatrice était géniale , j'ai passé de super moment. 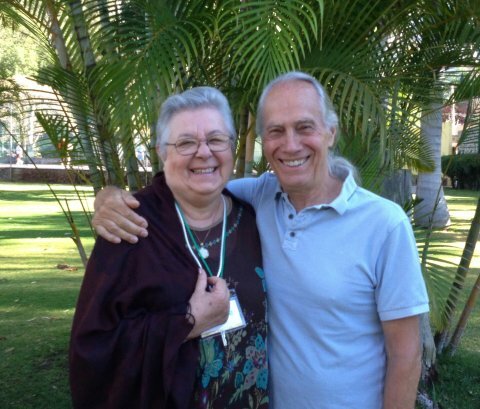 Love Claudine and the experience and highly suggest this course for true Awakening!